Greetings from our studio in the Highlands of Scotland, in which we have been intensively working away for the past 24 months on the final stages of Paul’s ‘Elphen Chronicles’. There is only one word that best describes such intensive focus on creativity and it is this – obsession. How else would any of us explain why it is we pursue the need to create? And those of us who do create are utterly privileged to be doing so. When you think about it, it is quite extraordinary that human beings can pick up a tool and make marks with which to communicate with fellow human beings. Whether that mark is a drawing, or painting, a note of music, or a word. Creativity is not a luxury, it is something that impacts on the lives of everyone in the world – it is a form of communication, every bit as much as it is a form of self-expression. We two have been together for 50 years; we met at art college and have ever since been obsessed with the need to create and share our passion. It is not an easy path, the creative one; for not everyone understands the ‘value’ of creativity – by which we do not mean the monetary value. Yet over the years we have embarked on and worked enthusiastically on many dedicated projects, in each case focused on creating something which we hope finds a place in someone’s heart and mind, something to bring joy and pleasure – it is as simple as that. So here we are, once again emerging from an intensive period; this time one of many years work by Paul on a series of paintings and writings for ‘Webstrand, the Tooth Gatherer’; the second book in his ‘Elphen Chronicles’. Those paintings and writings are only the start of it all and we are thrilled to share with you the ‘collaborative’ nature of the project as it has progressed. First off-the-press, so to speak, is our upcoming release of the Artist’s First Edition Video-Book version of Paul’s highly illustrated Science-Fantasy, Folk-Lore story. Conceived, filmed, created and produced by Eileen, the Video-Book follows Sunita Gahir’s glorious design progression of the Print-Book as it mirrors the changing character and nature of Paul’s story. Where would we be, were it not for the amazing concept and designs for the Artist’s Special First Edition Print-Book, by our fellow creative and collaborator, Sunita Gahir. An extraordinary book designer, whose passion for the art of publishing and book-making drives her compulsion to create books that people will cherish. For that matter, where would any good story-telling be, without a good sprinkling of music that sweeps the viewer along, as the story unfolds; capturing the mood of joy and fear, good versus evil, a lightness of step and heaviness of heart. Again we are very fortunate to have our fellow creative and collaborator Liza Mulholland, on board the ‘Elphen Chronicles’ – for it is she who has composed the original Music and Soundscape that accompanies Paul’s story-telling in the Video-Book. Liza’s interpretation of ‘Webstrand, the Tooth Gatherer’ in spired and influenced Eileen in her work on producing the Video-Book. 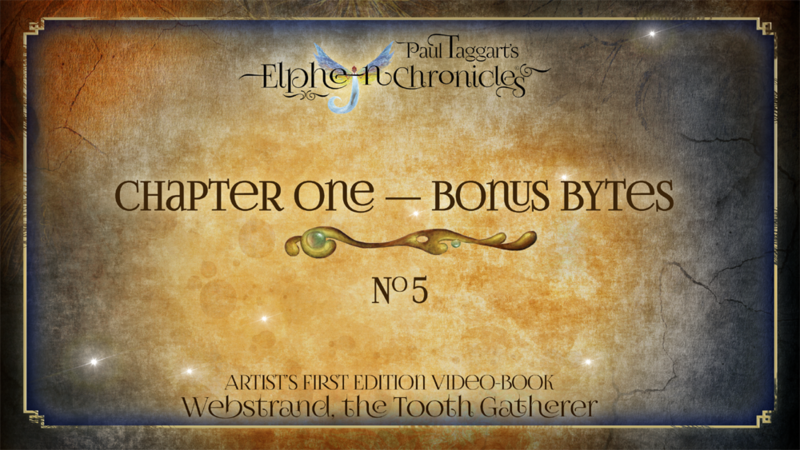 We are now counting-down to the UPCOMING RELEASE of 'Webstrand, the Tooth Gatherer' ARTIST'S FIRST EDITION VIDEO-BOOK – where you can PLAY FREE-TO-VIEW Bonus Bytes No. 5, featuring one of six little gems from Chapter 1 - CLICK the FOLLOW button to keep up-to-date with 'Paul Taggart's Elphen Chronicles', as we upload more of these FREE-TO-VIEW Bonus Bytes in the coming days (Bonus Bytes No. 6 is already there). LISTEN to his uniquely written chronicles of 'Webstrand, the Tooth Gatherer'. LISTEN to Paul reading through the nine chapters of 'Webstrand, the Tooth Gatherer'. LISTEN to the originally commissioned Musical Soundtrack and Soundscape. 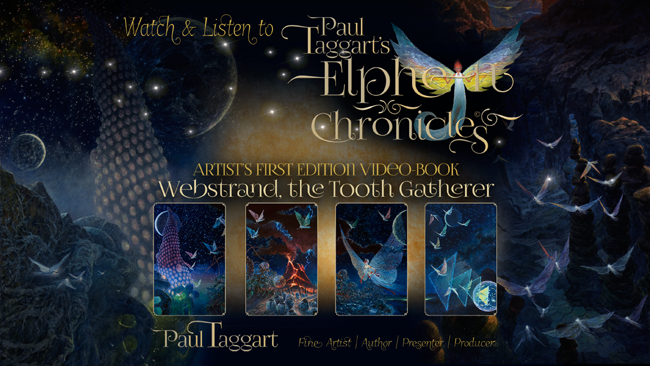 'Webstrand, the Tooth Gatherer' - Written & Illustrated exclusively by Paul Taggart, featuring 20 Masterworks (Full Plates) and more than 140 detailed Oil Painting Vignettes throughout. 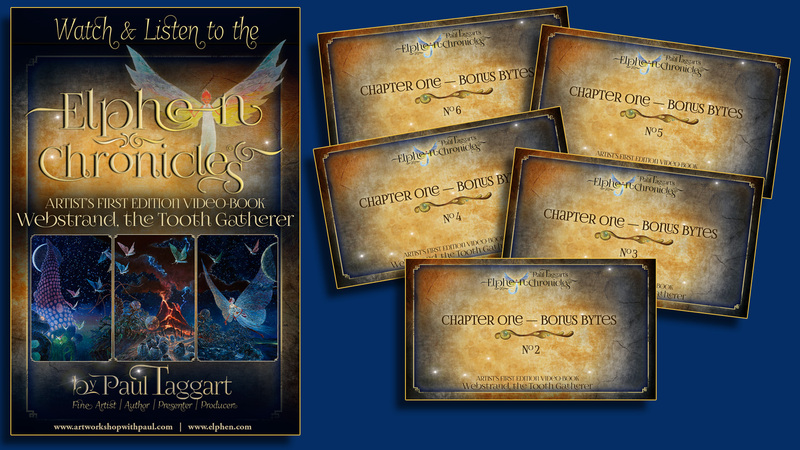 Click here for MORE FREE-TO-VIEW Bonus Features & Trailers from ‘Paul Taggart’s Elphen Chronicles’.